With Regis and Oprah Gone, Will Daytime Talk Go the Way of the Soap Opera? 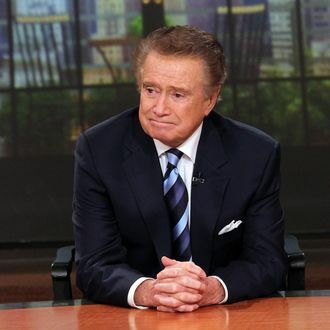 Regis Philbin’s last show on Live today marks this year’s second seismic shift in the once-stable daytime-TV landscape, following by just a few months the end of Oprah Winfrey’s quarter-century reign as the queen of talk. Such transitions are part of TV’s circle of life. Whenever big names move on, the culture immediately wonders who will replace the icon, and whether the newcomer can fill their shoes. But when Dan Rather took over from Uncle Walter or Jay replaced Johnny, nobody ever questioned whether the evening news or late-night TV could survive the transition. These days, change is more dangerous. Ratings for most TV scheduling blocks are way down; entire genres are in danger of disappearing. We’ve already seen love in the afternoon all but extinguished, with just four network soaps remaining after One Life to Live dies early next year. Letterman and Leno, hammered by brutal cable competition, now regularly average less than a 1 rating in adults 18 to 49. So with Oprah and Regis now gone, are we nearing the end of the talk-show era? Actually, no. First, let’s get Live out of the way. Even though no replacement has been named, the odds are Live will have no problem surviving sans Reege. Kelly Ripa has had ten years to build a constituency at least as loyal as his, while exec producer Michael Gelman is an evil, metrosexual genius who long ago perfected the formula for mainstream mid-morning TV perfection. Plus, viewers have grown slowly accustomed to tuning into the show and finding Philbin missing owing to his frequent vacations and a shortened work week. As for the remaining field, there’s no question Winfrey’s sign-off has left a massive hole in the daytime landscape. During its final two seasons on the air, The Oprah Winfrey Show averaged about 6.5 million viewers every day, easily making it TV’s top syndicated talk show. So far this fall, Oprah-approved gabbers Dr. Phil and Dr. Oz have taken over at the top of the Nielsen chart, ranking No. 1 and 2 respectively, but they’re drawing far fewer eyeballs than O did: Phil pulls just 4 million each week, while Oz averages 3.7 million. The only other shows breaking the 3 million mark are Live (3.4 million), Jerry Springer (3.1 million), and Ellen (3 million). The good news, however, is that daytime audiences don’t seem to be totally tuning out the talk genre. Instead, much like GOP primary voters, they seem to be checking out the Not Romneys Oprahs: The two doctors are both up nearly 20 percent over last season, while Ellen and Live are up about 10 percent. This doesn’t mean producers won’t have to adjust their expectations. Despite heavy marketing, a CNN platform, and good station clearances, Anderson drew a mere 1.6 million viewers during the most recent syndie ratings period. Rachael Ray, even after several seasons, still draws just a bit more than 2 million viewers. It’s also baffling why, despite Winfrey’s very long good-bye, more syndicators weren’t ready to jump into the fray this fall, or that more didn’t take chances a few years ago, slowly building name recognition for new talk talent in preparation for Winfrey’s inevitable exit. (No offense to Wendy Williams, but it’s doubtful anyone ever envisioned her as the next Oprah). Still, even if they’re a bit tardy to the daytime party, syndicators are at least investing major resources in the talk genre, launching more new talk shows next fall than at any time in at least a decade. “It’s like the Wild West out there. We haven’t seen movement like this in years,” Grossman says. While this is no guarantee that daytime talk will be around ten years from now, it’s a signal that the industry isn’t ready to write off the format, the way soaps seem to be slipping down the drain. As Grossman notes, “The money to be made is down from what it used to be. But it’s still good money.” Just don’t expect Katie or Anderson to be handing out cars to audience members anytime soon. With Regis Gone, Are Daytime’s Best Days Over?